unfortunately the weekend is almost over (sigh...).... don't mind me it's my Sunday's depression time (hehehe, every Sunday same hour!!!). Does that happen to you too?? 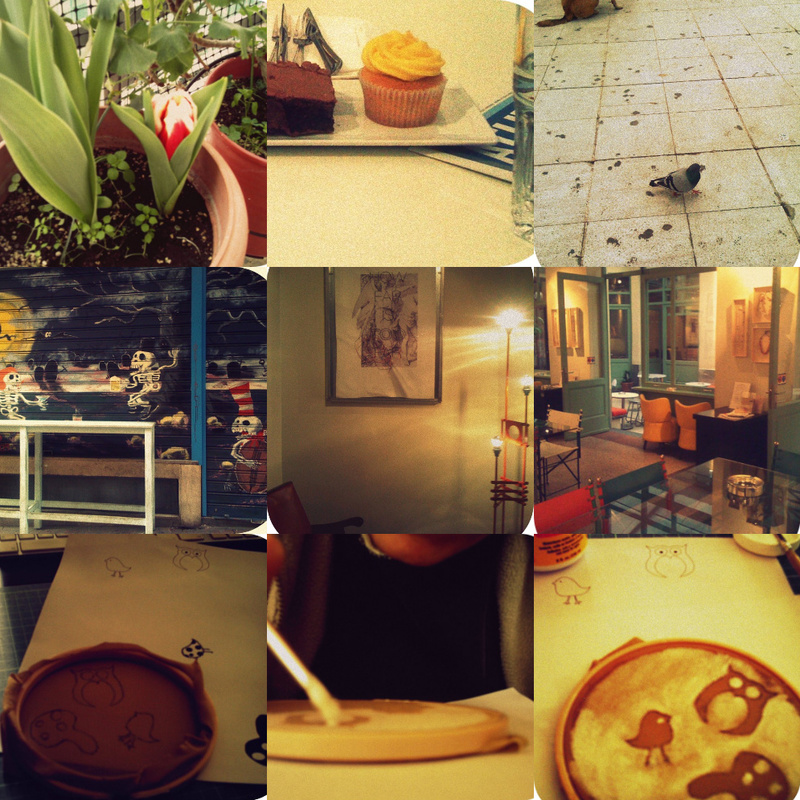 I discovered my first tulip on my balcony :-) and tested my first lemon-butterscotch cupcake (mmm..yammy---drooling actually), that bird looked very hasty and ssooo cute [pls don't pay attention to the filthy pavement], those are the best store blinds I've ever seen, seen an art exhibition [How far is too far] by a local artist Natassa Biza, hosted by our favorite place Bartesera, traced my pattern on my hoop for the preparation of screen printing, me modge podging, all layered and ready to dry..
Hope I made you smile, I know Fish Chris will!!! Good coffee, good company and cupcakes! What's not to smile for? Hi from your newest follower. Wonderful Blog you have. When you get the time please check out my blog and return the follow. I am going to be having AWSOME giveaways all throughout the year. Also PLEASE consider buying one of my cookbooks as it is our ONLY Income. Your weekend made me smile, your life looks lovely. I call your depression "The Sundays", I used to get it from having too much fun, drinking too much and not sleeping enough all weekend. When you get the The Sundays, you just want to snuggle on the couch, and eat tomato soup and a bagel (or some other bread product).